Arctic Cod Liver Oil™ Liquid - Lemon 8 fl oz / 237 ml (Nordic Naturals) - Penn Herb Co. Ltd.
Support the heart, brain, and nervous system, and promote optimal immune system function. 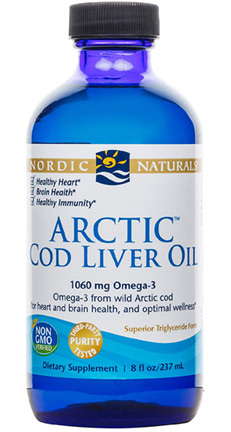 Nordic Naturals flavored Arctic Cod Liver Oil liquid is perfect for customers who don’t like to swallow pills, and it's so tasty it is hard to believe it's from fish - great lemon taste. Our classic Arctic Cod Liver Oil™ has always been derived from 100% wild Arctic cod—no other fish oils or synthetic additives are ever used. Every batch is tested by a certified lab for environmental toxins, including heavy metals. Wild caught. Omega-3 from wild Arctic cod for heart and brain health, and optimal wellness. Guaranteed purity. 1 teaspoon daily with food, or as directed by your health care professional or pharmacist. Refrigerate after opening. CONSULT WITH YOUR PHYSICIAN BEFORE USING IF YOU'RE ALLERGIC TO IODINE, USING BLOOD THINNERS, OR ANTICIPATE SURGERY.